Some days I feel I should just paint my van yellow because I spend a great deal of time driving to and from the gym and to the ball field in the spring and fall. Thankfully, I have found a new passion to keep me busy while driving, Audio books. Audio books and audio theater are my new favorite things to listen to while I am out and about. 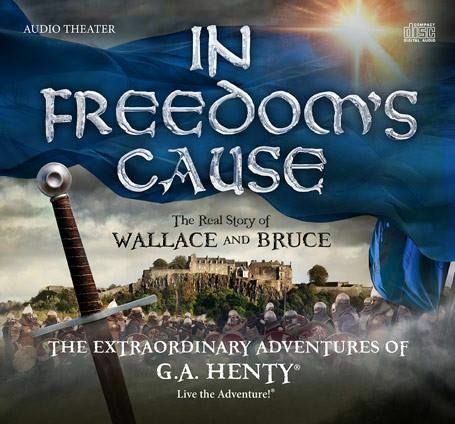 A few weeks ago we were asked to review the new audio drama from Heirloom Audio Productions called In Freedom's Cause. The two CD set of this high energy and fast pace story focused on building character for the next generation while bringing history lessons to life within the chapters. With the extremely high quality audio reenactment of this story it is perfect for ages 6 years old to adult. My youngest daughter who is 5 years old has also enjoyed this radio drama too! Thinking Further ~ have your child think a little bit with these questions to increase understanding of the characters actions or intentions. Defining Words ~ enhance the understanding of the story by knowing what selected vocabulary words mean prior to listening. As part of this review, I also received a PDF copy of the study guide which is just an expanded edition of the one included in the CD set. The study guide also includes three brief Bible study suggestions to help you and your child gain a clearer understanding of godly character. $20.00 for an audio MP3 download that gives you instant access and includes bonuses like the Study Guide and printable copy of The Prayer Of William Wallace (Psalm 23 in the Latin Vulgate). $29.95 plus $6.95 shipping gets you the two CD set plus the two bonuses above and the MP3 download. $99.97 plus $9.95 shipping gets you the Family Four Pack this gets you 4 CD sets, all of the bonuses mentioned above, plus 5 additional bonuses: 30-minute video documentary download titled, "Behind The Scenes In London". Free unlimited access to the In Freedom's Cause Membership Website. G.A. Henty's original In Freedom's Cause E-Book with all new colorful graphics. A professionally designed, printable promotion poster featuring the star-studded cast of In Freedom's Cause. $249.97 gets you the "Patriot's Freedom Package” which includes 25 CD sets to give away to friends and family. This set is great for churches, community groups or to give to extended family members. All of the prices listed above come with a 90 day money back guarantee if you are not satisfied. Since we are on the go almost every day of the week we strictly listened to this while traveling. The girls were silent as the story played, eagerly listening for each detail. Sometimes we would stay in the van until a chapter had ended just so we could hear the end of the story. I really like the fact that the stories where numbered so we could find our spot quickly. So, what’s the bottom line?! I was so excited when this new audio CD arrived in the mail! We love this CD and the values that are represented. I would recommend this product to any and all looking to add a bit of family friendly audio / radio drama into the home. The girls and I are especially excited to hear that another installment from Heirloom Audio Productions, With Lee in Virginia, will be released soon. Cant wait to check it out and add it to our collection too! Be sure to see what my Crewmates thought of In Freedoms Cause by clicking on the banner below. Hi there! Can you believe It, review season is back upon us for 2015. I am so excited to share with you some fantastic products this year! So hang on for the ride, it's going to be exciting and I hope you find something to use for your family. In 2011, Great Commission Films produced an eye opening documentary about the state of our country's public school system called IndoctriNation. IndoctriNation was produced by a Scottish filmmaker and homeschooling dad of seven, Mr. Colin Gunn. During the documentary he and his wife embark on the ultimate field trip with their children as they travel across the United States in a big yellow bus. The symbol of public school education. ~ How was the educational system established in America? ~ Are public schools religiously neutral for all? ~ Are my kids morally and physically safe within the walls of the schools? ~ Should Christians send their children to public schools to be the "salt and light" within the school system? ~ Can the public school system be converted back to its original purpose? As the viewer you get an eye opening account on the state of our public school system. Did you know that there are 14 nations that score better than our great country in reading? Or that 30 million adults in our country over the age of 18 can not read simple everyday sentences? How about the fact that 1/3 of the children in the school system drop out of school before graduating? "Conflict with God's laws and man's law"
The DVD states that 90% of Christians send their children to public school to be the "salt and light" within the school system. Research has shown that this argument/approach is not working. School is supposed to be a safe haven but with the increase of violence, drugs and alcohol abuse, and s****l sin happening against our children it is far from that. Facts like these are mind blowing to me! We did not start off homeschooling our girls from the beginning. My oldest three girls, Marie, Madison, and Mikayla, were exposed to both public and private school setting before we brought them home to school when moving to our current state of residence. I will say that the deciding factor to bring them home was an overwhelming sense put in my heart that I would be throwing the girls to the wolves if I sent them to the local schools. I knew deep down that my husband and I could provide a better education than that of the school system we reside in. Sure we looked at the local private schools as an option, but at the time of the moving here we were not in the position to pay for two mortgages plus private education for 4 children in preschool through 7th grade. I am the product of the public school system from kindergarten through twelfth grade graduation, and I would say that I turned out pretty well. However, this is a different world we live in with different evils that come along with it. I watched this documentary several times over the course of the six week review period and learned something new each time. Sometimes my mouth dropped open with the staggering facts presented. Do I think every parent should homeschool? No! Do I think every parent should watch this documentary? YES! I am not saying that homeschooling is THE only way to go, but we as Christians must be careful of who and what our children come in contact with on a daily basis. We must keep our guard up and protect our children so that they do not fall pray to the evils of the world. I love the fact that God has provided a way for me to stay home so that I can educate my children without all of the worldly distractions. Be sure to check out what my fellow CrewMates thought of this documentary by clicking the banner below and reading some of the other reviews.